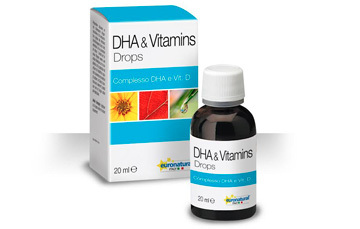 Dha is a major structural and functional building block of the brain – about 30% of the structural lipids of the grey matter are DHA and it is required during foetal and child development of the brain. These two facts clearly demonstrate the physiological importance of DHA for humans and have resulted, for example, in the frequent inclusion of DHA in infant formula. Extensive research has shown the effectiveness of DHA in applications such as cardiovascular health, brain wellness and nutrition during pregnancy and lactation. This product is based on a vegetarian source of docosahexaenoic acid, derived form naturally occurring microalgae, which are grown under fully controlled conditions. Advantages are: no toxic impurities / environmental ( less risk to health , superior organoleptic ( taste and aroma controlled ), origin from renewable sources ( respect of environment). The formula is enriched with Vitamin D3, Vitamin A and Vitamin E, useful elements up from the Birth. 12 drops (0,5 ml) twice a day during the main meals. Contact us if you need further information about our product. Our staff will reply as soon as possible. To stay in touch and up to date on our latest news, you can follow our social profiles! For you lots of tips on how to get the most out of our products and the best natural remedies.